The longer vessel (49’compared with the earlier models’ 44’) not only looks more elegant but performs as flawlessly as her shorter sisters. Yes, there is much more buoyancy in the stern, but it has been addressed by repositioning some of the hardware and loading in more water and diesel. Black Pearl will be based in Wellington and her owners (a family of six diving and fishing fanatics) plan to use her on extended voyages around the Marlborough Sounds. She carries cruising essentials such as a watermaker, dive compressor, genset and – wait for it – a transom-mounted clay pigeon launching device for keeping your shooting eye in trim. Salthouse has given the new model a more "European flair" – something best illustrated in the new cabin top with its fluting along the sides. Check out the low profile spoiler that has been added for mounting the satellite dome and aerials, and the mast’s modernised wingtip extensions. She remains a classically themed design but oozes excellent pragmatism and functionality – classy rather than brassy – and it’s all presented with elegance. Extending the hull hasn’t altered the beam, yet there’s a lot more space in the 49-footer. That’s largely a result of rearranged bulkheads and the much larger cockpit. The two most significant improvements (for me) are the addition of a second bathroom (in the cockpit) and the removal of the centre post between the cockpit and galley. 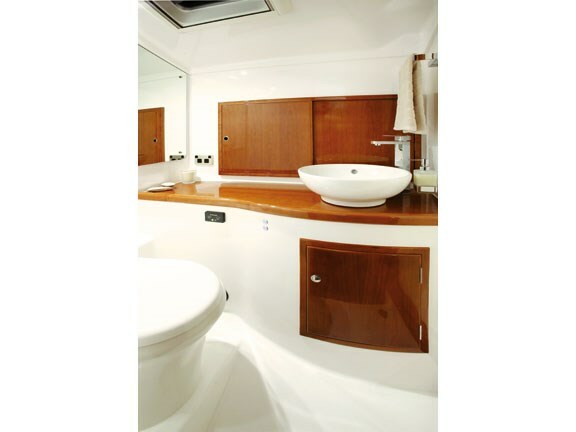 As with all of the Next Generation boats, Black Pearl presents exquisitely detailed timber joinery, and this is nowhere more in display than around the galley. Drawers glide open and close silently, equipped with vacuum push-lock latches. And the full-height pull-out pantry shelving system is still one of my favourite features. 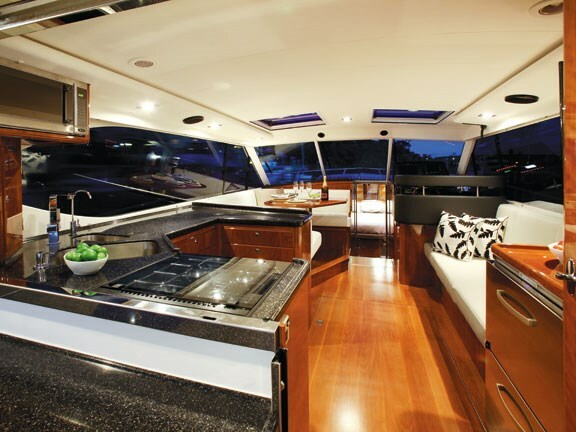 Black Pearl is beautifully styled and the interior is a classic blend of gleaming cherry wood joinery (she’s the first Next Generation launch to use gloss rather than matt varnish), white/dark gray vinyl and granite surfaces in the galley. 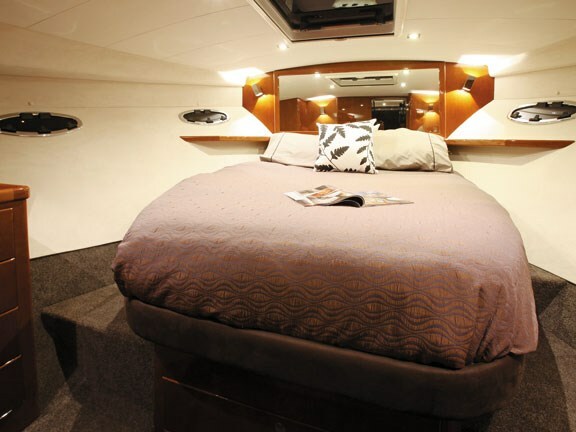 Sleeping accommodation is split between the sumptuous island bed in the forepeak (bathroom en suite) and a large, three-berth cabin slightly aft on the port side (one above, two below). With an inset squab the two lower bunks quickly convert into a very spacious double bed. Lowering the saloon table creates another double bed. The boat’s rod locker is very cleverly incorporated into the extended cockpit overhang. Its athwartships overhead locker hinges open to present a selection of your favourite blue-cod hunting weapons – practical but aesthetically sensible. Salthouse has used the extra under-floor space to run stainless steel ducting through the cockpit lockers. The ducting carries hot air and is designed to aid the drying of wetsuits after a day’s diving. 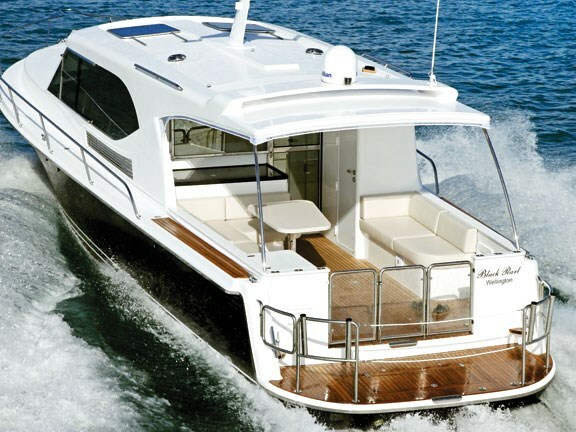 Black Pearl’s owners have taken full advantage of her extra room, equipping her with standard 240-volt domestic conveniences such as a washing machine, drier and extra fridges. But for me the vessel’s coolest feature is its C-Zone digital network. Rather than run a complex wiring loom around the boat, Salthouse has elected to use C-Zone. A network comprising a single "spine" to which all components are connected, C-Zone not only radically reduces the amount of wiring and switches required, but also offers a remarkable degree of control over those components. For example, you’re able to programme "lighting profiles" into the system, reflecting a variety of ideal modes/moods (cruising at night, at anchor, entertaining, sleeping, etc). It micro-monitors the vessel’s various systems, with in-built alarms to warn you of any aberrations or malfunctions. 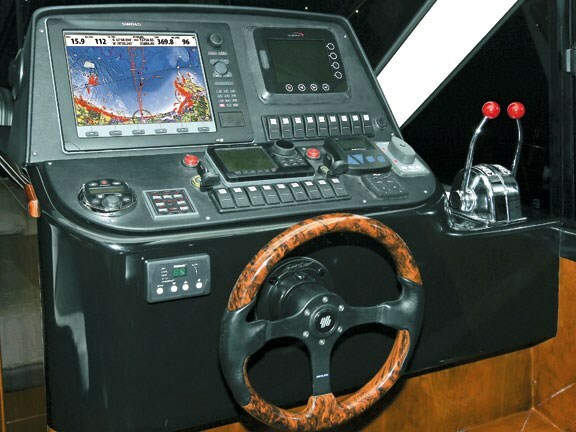 And it’s all easily viewed on the large Murphy screen (part of the MTU engine package) and the Simrad C12 chartplotter. For me, the magic is best illustrated by the remote control. Having docked the boat, the owner clicks the remote as they disembark. 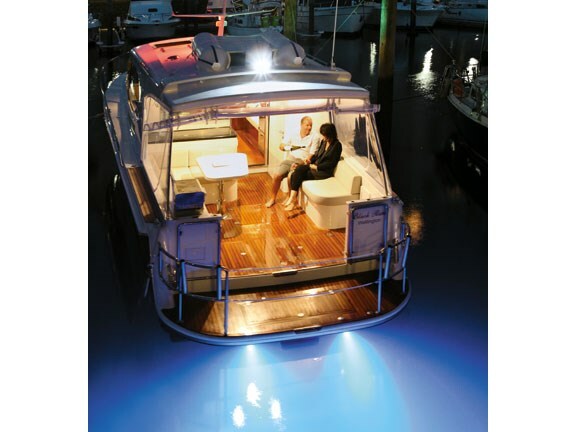 C-Zone automatically defaults to dock mode – switching off all the lights/electronics, activating the monitoring programme (bilge pumps) and sets the alarms. How cool is that? Keeping all this electronic wizardry alive understandably requires some serious power – so we have 660a/h house batteries, a 150a/h start battery and a separate battery for the bow and stern thrusters. 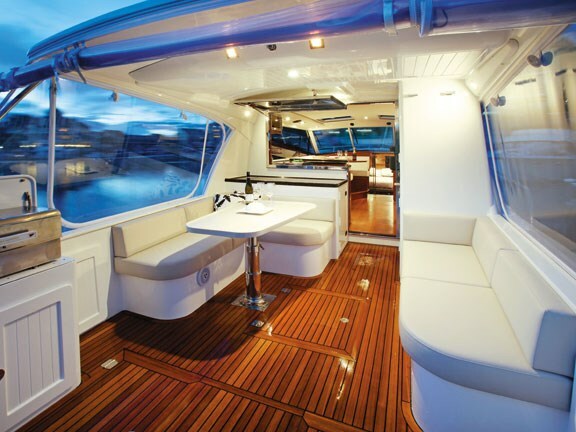 Black Pearl is fully air-conditioned and strategically-positioned outlets around the helm station/saloon also act as demisters. Using hand-laid GRP (balsa core) with a vinylester barrier coat as an osmosis-antidote, the vessel’s solidly constructed. And despite being considerably heavier than her shorter sisters (12 tonnes laden versus nine), Black Pearl’s powered by the same engines – a pair of 345hp MTU 6R700 M94 common rail diesels. Relatively light for their generous torque, the engines propel Black Pearl to around 29 knots at wide open throttle (3850rpm). At cruise speed (17 knots) the engines are turning over at 2500rpm and burning 50 litres an hour between them. She carries 1220 litres of diesel – plenty of range for extensive Sounds exploring. 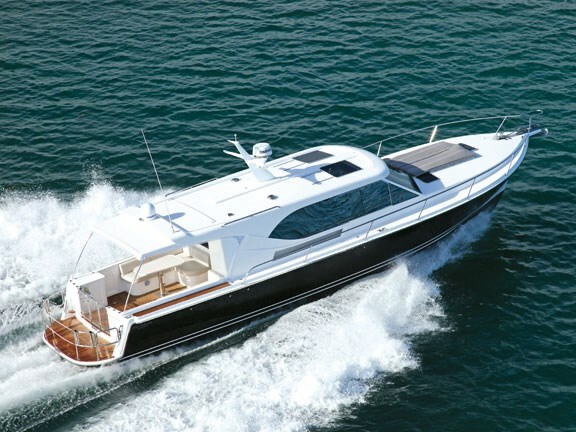 The builders have also pulled off a great job with engine insulation – a crucial issue given that there is no flybridge for escaping the noise. A sound meter on an iPhone app showed the engines producing 80-81 decibels at cruise speed. Normal conversation registers around 75dB; flat out, the noise level climbs to 90dB. Underwater exhausts help to minimise the noise and eliminate any burnt diesel odours. As with the smaller Corsairs, the Euro retains the full keel and skeg with a single rudder – a large contributor to the unwavering tracking (forward and reverse). She draws about a metre. Manoeuvring this lady is a breeze at docking time thanks to power steering and bow and stern thrusters. This beauty carries everything any self-respecting pirate king would aspire to own, not the least of which is that large island double bed and gourmet kitchen for the wenches. 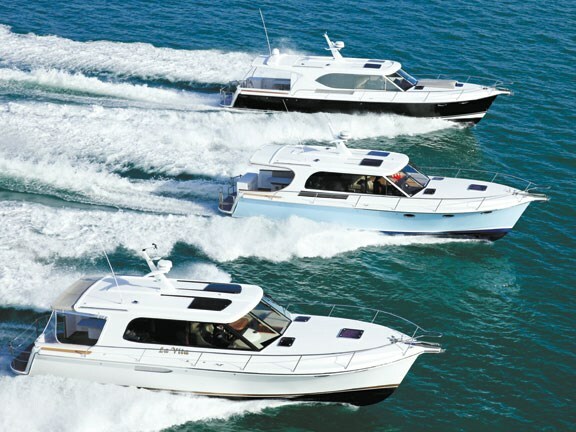 For more information, contact Dean Salthouse at Next Generation Boats, ph 09 420 4789, email deansalthouse@clear.net.nz or visit www.nextgenerationboats.com. See Salthouse boats for sale.